The stainless braided hoses are best suited for the most rigorous applications. The decision to upgrade your systems to a durable hose can help improve your performance and life-cycle of your system with less down time. The durability surpasses most rubber hoses in the market. There are many choices when picking the right hose for your system, choosing the right hose assembly can improve the overall production cost as well. Braided Stainless Hose is a good option when looking for a durable hose assembly. PTFE Lined hoses are the best options when deal with adhesives, chemicals, and other corrosive applications. Stainless hose generally comprise of a PTFE liner or an all metal liner reinforced by stainless steel braid. The steel braid provides hoop strength for the hose as well as provide added strength to handle higher pressures. With the PTFE liner the hose will be good to handle up to 450°F degrees. For application where higher temperatures are needed the all stainless liner is the right choice, which can handle from cryogenic to 1500ºF degrees. 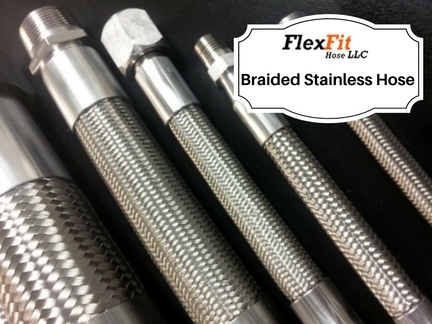 The benefits of stainless steel braided PTFE lines are that they have a longer life-cycle with a not stick liner which is ideal for process and automation, filling machines and solvent transfer lines. Generally, these hoses are durable and can be used for many different types of applications.